I have just returned from my annual ski holiday with my family and this year we sent to Val Thorens in the French Alps. I have been skiing since I was ten and it’s certainly an event in the calendar that I get more excited about every year! Last year, I got engaged whilst on the slopes and this year we were lucky to enjoy a full week of glorious sunshine. 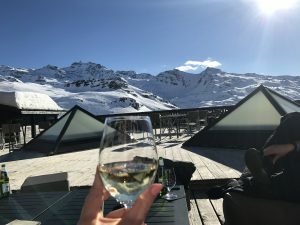 If you’ve ever wondered if a ski holiday is for you, here’s my top ten favourite enjoyments of my snowy retreats! Being over 2000 m high up a mountain side certainly makes for phenomenal views. Add a thick covering of white snow, green fir trees and endless mountain peaks against a clear blue sky, the views are truly breath taking. No matter how many times I have sat on a chair lift high above the pistes, I literally can’t get over how beautiful it is! Even if the skiing element isn’t for you, the photo opportunities are endless and are sure to impress every traveller! You can burn approx. 500 calories an hour skiing and anyone who has slaved away in a gym will know how much sweating is involved to burn this many calories. Don’t get me wrong, thigh burn and sore feet in those first couple of days of skiing is a pain, but to burn 500 calories an hour whilst having such fun, with the wind in your hair and surrounded by the most beautiful scenery is surely the most exhilarating form of exercise out there – If only we could all just ski for an hour a day! Because of above point, it naturally means you are entitled to eat exactly what you want whilst on a ski holiday without feeling the slightest bit guilty. We normally ski in the French Alps and it’s as you imagine… think tasty cheesy fondues, Tartiflette, steak, Raclette, warm croissants and Rostis! 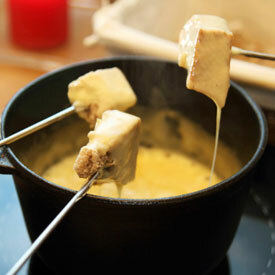 All the warming, cheesy yumminess we normally reserve for Christmas indulgence! Plus it’s of course completely fine to consume 2-3 chocolate bars per day to ensure you don’t burn out on the slopes. Now at the age of 27, I am not the fearless 12 year old of my early ski days. As years have gone by, although my skiing technique is likely to have improved, my fear of falling over has greatly increased! So when I tackle a dreaded black mogul run, I feel very proud of myself indeed! 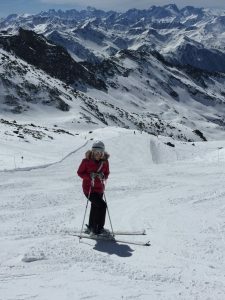 During our family holiday, we also have a ski challenge day, where we ski across Les Trois Vallées in the Alps and back again. The most mileage we’ve clocked up in one day in 35! After a long day skiing, it’s obligatory to do ‘Apres Ski’, which literally means the social activities and entertainment following a day’s skiing! So whether that’s a rave up at one of the party favourites such at the La Folle Deuce or a relaxing mulled wine at the local pub near your chalet, a drink in your ski gear before you head home is a must! Your ski outfit is what you will be wearing for the majority of the time, and most people will only have one they wear all week, so getting it right is very important! I love seeing all the different skiing outfits people wear, whether you’re channelling Victoria Beckham wearing your designer jacket, or in your matching unicorn onesie with your university friends, there’s so many ski vibes to look out for! Unless you are planning on skiing all day and partying all night, the evenings on our ski holidays are so relaxing. We normally stay in a self-catered chalet, so if we don’t go out for dinner, our evenings normally consist of sitting on the balcony with a glass of wine, chilling in the hot tub, a cheese board and a good box set! My cousin was two when he had his first lesson and now at 19, he is amazing on his snow board! If you have young children, don’t be put off going on a skiing holiday as it’s definitely easier to start young as they don’t have as much of the fear factor. 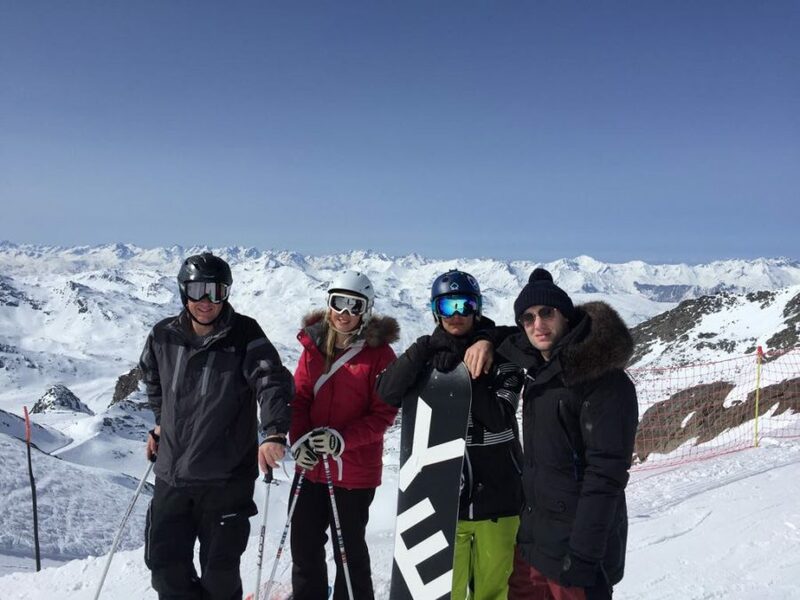 It’s a great way to spend time as a family, watching everyone’s achievements and touring the slopes together. It really is a lovely atmosphere on the slopes. There’s a sense of peace when you’re on the piste! Everyone is really enjoying themselves, there’s music coming from all the bars as you ski down, the restaurants are packed, people look out for each other (most of the time) – it’s all just so enjoyable! There’s much more you can do if skiing or snowboarding down the mountain isn’t for you! 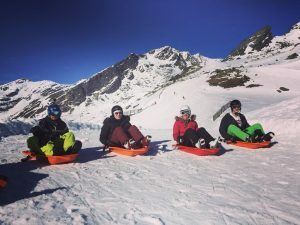 You can put on your snow shoes and try a mountain walk, brace a toboggan run, take in the sights whilst snowmobiling, relax on a husky sleigh ride and even zip wiring!